Before visiting our volunteers in Ho I had been in touch with Ailsa Murray who was a medical volunteer working in Ho. Ailsa has been a regular volunteer with Projects Abroad, previously working in Sri Lanka and Moldova. It turned out that Ailsa had worked with Boris Topor who had hosted me as a volunteer in his family in 1992. It was great to be able to meet up. Ailsa had organized a meeting of volunteers at the Projects Abroad Ho office. She explained clearly her ideas. The Leprosy village is very close to one of the clinics Projects Abroad works with in Ho. On visiting the village Ailsa quickly recognized the neglect and poverty in this area. Schoonhoven village was built in 2006 to house a group of lepers and their families. Ailsa felt volunteers on other projects would also be able to contribute not only the medical volunteers. A trip to the village was organized. The problem that medical volunteers have started to address is regular cleaning of the wounds that come along with leprosy. There is no chance of catching leprosy. Other volunteers spent time with children related to the lepers. The volunteers have now painted a room where medical materials can be stored as well as food donations. It can also act as a treatment room. The volunteers found many of the lepers were sleeping on the floor so they got together and donated a mattress for every leper. They also paid for medical insurance for every leper for the next year. This is something the government used to pay. 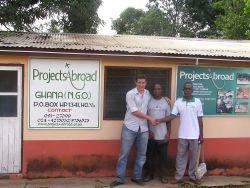 The Ghana Projects Abroad team is keen to make this project sustainable. The project was publicized on the main news program in Ghana although the person who really got the project going was camera shy! Even though she has returned to the UK and her studies at Aberdeen University Ailsa is remaining involved in the development of the project. Well done, Ailsa.